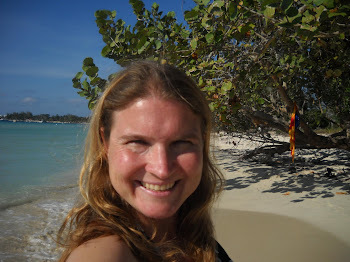 I began developing my daily writing habit in December 2006 – over ten years ago! Since then, I have written almost every weekday, except for vacations, of course. And, I have written a ton. I also have published a lot. In 2006, when I began to write daily, I had two published articles and a dissertation. Today, I have published five sole-authored books, over 50 articles and book chapters, and dozens of blog posts, online essays, and OpEds. A few years ago, I wrote a post about how to write every day. This post is about why daily writing works. I have writing on my calendar every morning. I write for two hours a day most days, and I get in a minimum of 30 minutes of writing on days when my schedule is packed with teaching and/or meetings. I thus write for a minimum of 30 minutes and a maximum of two hours every weekday. At the beginning of the week, I decide what writing tasks I will work on, and which days I will focus on which tasks. Sometimes, I have no pressing deadlines. This means I have to think ahead to figure out which writing tasks I should focus on. For example, I have an article due November 15. But, my co-author is working on it. I need to wait to hear back from her before I can work on it again. I also have been working on a grant proposal due in January. But, I don’t want to work on it now because I sent a draft to two readers. I am waiting to hear back from them before I get back to revising it. This means I don’t have anything to work on right now that has a deadline in the next couple of months. I thus am writing today only because it is a habit – not because I have an upcoming deadline. On Sunday evening, I pulled out my task list for the year to see what I can work on. I have three pieces due at the end of February 2019. For two of them, I have to wait for co-authors to do their part before I can move forward. But, there is one of them that I can work on. I thus am likely to finish that piece way ahead of schedule. And, that is great because I have two other pieces also due in late February. I think this is one of the main reasons daily writing leads to high productivity. If you set aside time to write, you will write regardless of whether or not you have an impending deadline. And, if you wait until you have a deadline to write, you might find that your deadlines are stacked together, making it difficult for you to meet them. My preference is to write daily, but the most important thing is that writing becomes a habit. If you set aside two days a week to write and write on those days no matter what, I suspect you would find the same thing – that you write because it’s on your schedule, not because you have a deadline. What about you? Have you developed a writing habit? Have you ever found yourself writing even though you don’t have an impending deadline? Are you looking for a reset after a long year of teaching? Are you struggling to get back into your writing for the summer? Many academics are mentally, physically, and emotionally exhausted at the end of the academic year. So, the first step is to intentionally take some days off. At a minimum, take the weekend off. And, make sure you have some summer vacation planned, as you will need a real break. I plan a two-week vacation with absolutely no work every year. This year, after my writing retreat, I will spend that vacation in Peru! I hope you are also planning a vacation for yourself this summer. 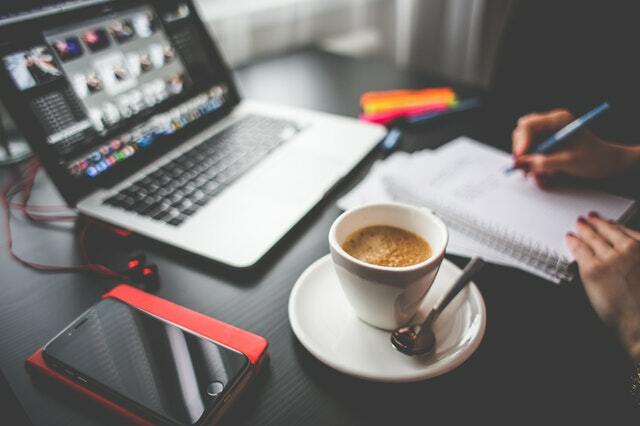 Once you are ready to get back to work, one strategy that might work for you is to set some ground rules for yourself to get back into your writing practice. I set ground rules for myself and adjust them according to the season. I find they are helpful to keep me on track with my writing. No social media before noon on writing days. Don’t check email until writing is complete. Complete two hours of writing before doing any other work or household tasks. Take the weekend completely off. Get some exercise 3 days a week. Spend at least one afternoon a week enjoying nature. Read fiction at least 30 minutes a day. What do you think would be good ground rules for you? 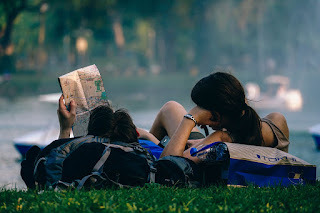 What do you need to do to keep up your writing practice this summer? If you want to be a super-nerd about this, you can do what I do, which is to create an Excel spreadsheet with your ground rules and give yourself a gold star for each week that you meet all of them. Also, keep in mind that it is perfectly fine - even recommended - to change your pace of work during the summer. I talk a bit more about "summer hours" in this post. I wish you a productive and relaxing summer – at least for those of you in parts of the world where it is summertime! A question that often comes up when I do campus workshops on work/life balance is how and when busy academic parents can find time to exercise. As we get older, it becomes increasingly important for us to exercise in order to stay healthy and keep our stress levels in check. I find time to exercise because I know how important exercising is for my mind and body. Like many aspects of work/life balance, how and when I exercise is something that has shifted over the course of my career. Here are a few tips on ways to make time to exercise as an academic parent. When my children were of pre-school age, I took advantage of the childcare offered at the YMCA in order to be able to work out. One strategy that worked for our family is my husband and I would alternate between going to the gym and cooking dinner. For example, on Mondays and Wednesdays, I would pick the kids up from daycare and drive them to the gym. My husband would stay home and cook. We’d get home around 7pm and eat dinner together. He would go to the gym on Tuesdays and Thursdays with the kids and I would cook. Some parents may not like the idea of having the kids in daycare all day and then taking them to the daycare at the gym. However, we found this system allowed us to spend quality time with the children during and after dinner. And, that was much preferable to us being stressed out and trying to prepare dinner with the kids running all over the house. Another way to get exercise in is to exercise with your kids. When my twins were infants, I would bundle them up in the jogging stroller and take them out for a jog or a walk. As they got older, I could walk or jog around the track while they biked. Eventually, I could walk or jog with them alongside me. Taking long walks with my tween daughter was extremely helpful for both of us at one point. Once my children became school-aged, I often had to take them to various afterschool activities. 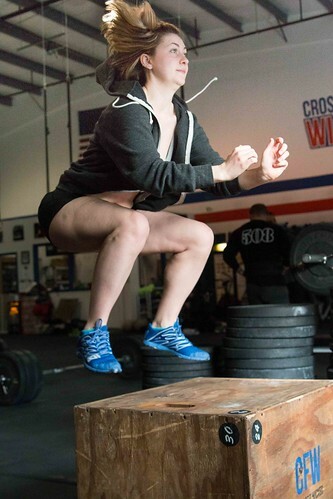 For example, I would drop my youngest daughter off at gymnastics for her 90-minute practice. Instead of waiting at the gymnasium with her, I would drop her off and use that time to exercise. Sometimes I would go to the gym and other times I would go for a walk or jog in the neighborhood near her gymnasium. When she played soccer, I would walk or jog around a nearby track during her soccer practice. As my children got older and became capable of getting themselves ready for school, I realized that the early morning was a perfect time for exercise. My teen-aged kids wake up and begin to make noise around 7am and leave the house around 8am. I am always awakened by their noises. Thus, I get myself out of bed, put on my jogging clothes, and go out for a 30-minute jog in the morning while my kids shower and get dressed. I then make it back in time to have breakfast with them. The bonus is that I don’t have to hear the kids arguing about whose turn it is to take a shower! I have been meaning to do yoga on a more regular basis for years. However, the class schedules never seem to align perfectly with my schedule. My gym has an 8am yoga class that I really enjoy on Tuesdays. That doesn’t work perfectly with my schedule because the class is from 8am to 9am, and it means I don’t get home until 9:15, and I can’t realistically start working until about 9:45. That puts a real dent in my morning productivity. However, I made a decision that I am going to just do it. I am going to go to my once-a-week yoga class even if it means I will have a little less time for writing on Tuesdays. I have been doing that for about a month, and, guess what, everything is fine! One way to get some mild exercise into your day is to have walking meetings. For example, if you need to meet with a student and the weather is nice, you can offer to walk and talk for your meeting. I have also gotten into the habit of arranging my phone meetings at times when I can take the phone call while walking. That way, a 30-minute phone call turns into a 30-minute walk. Of course, there are some meetings that require you to be in front of a laptop. But, there are many that solely require your attention. It can be challenging to find time to exercise when you have kids of any age. However, if you are creative with your schedule and willing to prioritize getting in your exercise, you should be able to make it happen. What are your tips for finding time to exercise when you have young children? Are you ready for the semester yet? Sorry if that question provoked a panic attack, but I am sure I am not the first one to ask you. I know I have been asked at least a dozen times this month. Preparing for the semester is rarely fun, and academics seldom feel ready when the semester begins. To change the mood a bit, in this post I will explain a few ways planning for the semester (or quarter) can actually be enjoyable. For me, one fun aspect of semester planning is looking at my (relatively empty) calendar and scheduling things I enjoy as well as things that are good for me – before my calendar gets out of hand. Trying to find time for something fun in mid-October can be nearly impossible for many of us who work on a semester or quarter system. But, right now, my October calendar is looking relatively open. So, why not schedule in some fun stuff now before all my time is taken? You may say to yourself each year that you are going to spend more time with your family or go to the gym more often. Putting it into your calendar now, however, makes that much more likely to happen. Here are some ideas for things you can put in your calendar now that you not only will enjoy putting into your weekly template or semester plan, but also will enjoy when they happen. When are you going to exercise this semester? How about a jog or a walk every Monday, Wednesday, and Friday morning or afternoon? Why don’t you check out your gym’s Fall schedule and see when that awesome yoga or Zumba class is? Perhaps there are two days a week when you can bike to campus? Whatever it is, try putting a repeating event in your calendar now. Plan something feasible – something you know you will actually stick to. My close friend and I try to plan at least one getaway to the beach every semester. We find a day that works and book one night at a hotel. We go somewhere fabulous for dinner, spend the night at the beach, go for a walk along the beach in the morning, and then head home. These trips are extremely rejuvenating. They can be super hard to plan due to our work travel and other commitments. But, now is the best time to plan them. If you can’t afford a night away at a hotel, perhaps you have a friend who lives near the beach or in a cabin in the mountains? Either way, looking at your calendar, when can you plan a quick getaway? When are you going to go out with your partner or your close friends for dinner or drinks? How about setting aside the time now? What would be ideal for you? Once a week? Once a month? Twice a semester? Whatever it is, make plans now so that you can ensure it happens. A mini-retreat is a day where you do not check email or social media, and instead, spend the day writing and doing things you enjoy. I explain those in more detail here. You can do these alone or with friends. The key is to plan the mini-retreat now, while you still have some open days in your calendar. Okay, this might not be super fun. But, have you had your dentist, eye doctor, and doctor visit yet this year? When is the last time you had a haircut? You might be able to get some of these things done before classes start. At the very least, you can make the appointments now so that you can get those appointments at a convenient time. Personally, I hate going to the dentist, but if I make my appointments well in advance I can get a late-afternoon appointment so that at least I don’t have to go back to work after my visit to the dentist. So, think about it: what are some fun things you can work into your calendar – while there is still some empty space in it? Finally, if you are thinking way ahead and want to sign up for our writing retreat in Peru, there are still a few spots left! Now, that would be something to look forward to! I wish you all the best with your semester planning and I hope you are able to put some things in your calendar other than classes, meetings, and work trips. Let me know in the comments what you have planned. 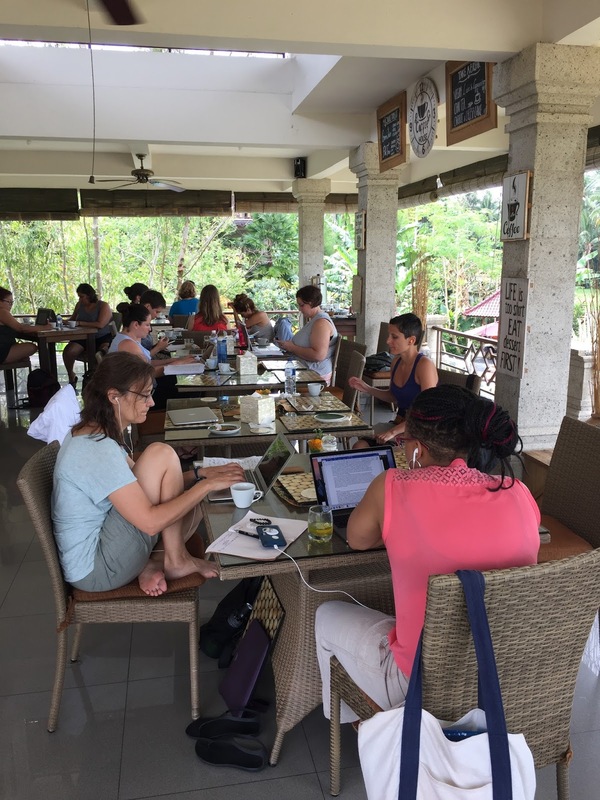 I began my summer with a fabulous writing retreat with 21 other women in Bali. During that week of bliss, we woke up each morning, had a healthy and delicious breakfast, meditated, and then wrote until lunch. In the afternoons, we shared work with the brilliant participants, and then went on a little adventure. 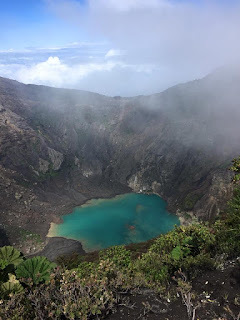 My goal with that retreat, which I organized with my amazing colleague, Ayu Saraswati, is to show people how it really is possible to be amazingly productive and enjoy life at the same time. This all seemed quite possible while we were in Bali. I am usually able to maintain a similar schedule in the summer when I have few responsibilities. But, how can this practice translate into the semester? 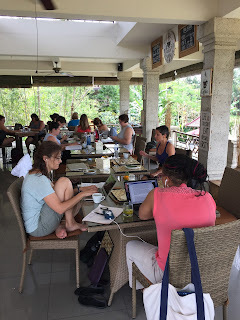 Writing in Bali with an amazing view! Is it possible to maintain this level of peacefulness, focus, and productivity when the demands of the semester ramp up? The answer to this depends in part on your schedule during the academic year, and in part on your perspective. Being calm, focused, and productive is very important to me. So, this semester, in addition to all of the practices that I usually incorporate, I plan to have a one-day mini-retreat of my own at least twice a month. I'd like to say that I will do it every week, but I know that is not feasible. So, I will aim for twice a month. I teach on Mondays and Wednesdays, and usually have meetings on Tuesdays and Thursdays, so Fridays seem like a logical day to carve out for my mini-retreats. I put "mini-retreat" in my calendar for every Friday, and then went through and deleted the ones I know will not happen due to travel and other commitments. So, what will I do on my mini-retreat days? First of all, I will not check email or social media on the morning of my mini-retreat days. This is hard for me, but experience tells me it is the best way to be productive and peaceful. My house is fairly busy in the mornings with my husband and three kids getting ready for their day. So, I will exercise in the morning while they are still in the house. This may include a jog or a yoga class, depending on the weather and the gym schedule. I will then enjoy breakfast with my husband and remind him that today is a mini-retreat day. I will begin my writing day at 9am with ten minutes of meditation. I will then use the pomodoro technique and get in at least 5 25-minute writing sessions. Then, I will pause to make and enjoy a delicious healthy lunch. I will then spend the afternoon doing something I enjoy either alone or with someone I enjoy spending time with. There are several beautiful hiking spots within an hour's driving distance from me, so I may go to one of those. I also could go for a swim, to a yoga class, or get a pedicure. The point is to do something I enjoy doing in the afternoon. I will have to plan some of my afternoon activities in advance so I need to make sure to make plans ahead of time. I may even plan some of these mini-retreat days out of town with some of my lovely friends who live in beautiful places. What about you: do you think you can work a mini-retreat into your semester schedule? I am sure you can pull off at least one well-timed mini-retreat - especially if you put it into your calendar now. Most of you can likely make once a month happen. And, if you are on sabbatical, this could be your everyday routine! Finally, if you are interested in the weeklong retreats that Ayu and I host, the next one will be in Peru! My husband is Peruvian and I did my dissertation research in Peru. It is one of my favorite countries, and we are going to one of my favorite spots in Peru - the Sacred Valley of the Incas. You can find out more about our academic writers retreat for women on this website. And you can sign up for the June 2018 trip here. Attending the writing retreat each year is a great way to renew my commitment to these practices, to nurture my creativity, and to remind myself of the joys of the life of the mind. I hope to see you there! Many academics will tell you to steer away from creating an edited volume. Yet, judging by academic catalogs, clearly, some academics continue to create edited books. Why would any academic pull together an edited volume? The reason is that there are some cases when creating an edited volume makes sense. I recently edited a volume for Oxford University Press and I will explain in this post why I did it, how I did it, and why I am extremely gratified to have edited this book. I decided to create Forced Out and Fenced In: Immigration Tales From the Field because I had an abundance of rich stories from my research with deportees that I wanted to share. I thought about writing a popular book that highlighted deportees’ stories, but I did not think that I had enough stories to fill a book. Moreover, I had just published a book based on deportees’ stories and did not want to try and spin another book out of that research. I did, however, want to reach a broad readership with the stories. As I thought about how to get these stories out to a broader audience, I asked myself if other researchers might also have stories that needed to be told. It turns out they did! When I reached out to my colleagues, I received an enthusiastic response both regarding the desire to tell these stories and to hear the stories of others affected by immigration law enforcement. In this case, it made sense to edit a volume as opposed to writing a monograph because I wanted to highlight a broad range of stories of people affected by immigration law enforcement, and I wanted a combination of historical and contemporary stories. This kind of project requires a team. It is also critical that the team was excited. This book gave the contributors an opportunity to share parts of their research that may not fit into a typical academic article or even a monograph. Forced Out and Fenced In highlights people’s stories. The argument and historical context form the backdrop. The contributors were excited about the opportunity to try a different kind of academic writing. This enthusiasm then translated into what might be the most seamless production of an edited volume in the history of book publishing. Forced Out and Fenced In: Immigration Tales From the Field was created in what must be record time due to the enthusiasm of the contributors and the extraordinary efforts of the team at Oxford. This volume took only a year to put together—practically lightning speed in academic publishing. In early September 2015, I sent a note to Oxford University Press editor Sherith Pankratz to ask if she might be interested in an edited book on immigration enforcement. She said she was. In mid-September, I sent a query out to twenty-five scholars. By mid-October, twenty-one of them responded and said they were willing to contribute essays. The other four politely declined. I wrote a full proposal and sent it to Sherith, along with a sample contribution. She got back to me with reviews in mid-December 2015. By January 2016, we signed a contract. I then reached out to the contributors and asked them to send me their contributions by mid-March. If you have ever worked with academic authors, you will find the next sentence surprising. All of them sent in their chapter drafts on time. We sent the full manuscript out for review, asked the authors for revisions, and they consistently met every single deadline multiple times. This is practically unheard of in academia. By mid-October 2016, every single author had sent me the final version of their chapters and we were able to get this book into production by the end of November 2016. The book was released in June 2017 – less than two years from idea to publication—which must break all kinds of records for edited volumes in academia. I was fortunate to have secured contributors who are not only at the top of the field, but are also timely and responsive. In case you are curious, the Table of Contents is below. If you are in the humanities or social sciences, you will see that I was able to recruit an amazing group of folks! Part I: Migration Histories: How Did We Get Here? Part II: Families Torn Apart: How Do Deportation Laws Affect Families? Part III: Living Without Papers: How Do Undocumented People Navigate the Challenges They Face? Part IV: Seeking Refuge: What Does It Take to Get Asylum in the United States? Part V: Gendered Exclusions: How Are Deportation Experiences Gendered? Part VI: Deporting DREAMers: How Do “American” Youth Navigate Their Lives in Mexico after Deportation? Part VII: Returning “Home”: What Happens to Migrants Who Return to the United States After Being Deported?